On Thursday Microsoft released a patch to fix the so-called Operation Clandestine Fox vulnerability that affected all versions of Internet Explorer. On Thursday of this week Microsoft released a patch to fix the so-called Clandestine Fox vulnerability that affected all versions of Internet Explorer. This fix was expected to be released “out of cycle” – meaning users wouldn’t have to wait until the usual Patch Tuesday that rolls around once a month. What wasn’t expected is that Microsoft, who stopped support for the 13 year old XP, released a fix for the outdated OS as well. Of course one could assume part of the reason Microsoft issued the patch to XP too is due to the media hype surrounding it this week. Even though Windows XP is no longer supported by Microsoft and is past the time we normally provide security updates, we’ve decided to provide an update for all versions of Windows XP (including embedded), today. If you need help making the transition, make sure to read out article: XP is Dead, Now What? it provides several options you have for getting off Windows XP – which by the way, only support IE up to version 8. The browser is now running at Version 11 on Windows 8.1. You can find out more detailed information about the security patch and individual downloads for the specific version of Windows running on your system via the Microsoft Support site. It’s worth reading as you might need to install another update in addition to this one for IE if you don’t have it already. if you have Windows set to automatically download and install updates, it should be on your system soon. Or you can get the update by manually running Windows Update. How long Microsoft continues to reverse course and actually issue security patches for XP remains to be seen. the boys in Redmond have put themselves in an interesting position, as more security vulnerabilities in Windows, especially XP, will continue to come. Will Microsoft fix this one, and the next exploit after that? I wouldn’t count on it. And if you’re still running XP, get off of it. We’ve been telling everyone to gear up for a new OS since the beginning of this year, and Microsoft has been telling the public to have a contingency plan for April 8th. Everyone has been warning users that XP was losing support, and more security exploits will continue long after this one. Microsoft gave existing users of XP a “freebie” on this, and I wouldn’t expect this to be a regular occurrence. It’s time to move on folks. If Microsoft would let me take the XP file management I would have gone long ago. Alas I need to take my hefty folders over to the XP machine if I want to search for a file that I can only remember some of the content of. Others that I sometimes need to find regularly are in particular the ability to select all picture files or a subsection of same. 7 and 8 are so gludgy to find a file on. Could you ask them to supply a similar functionality? I just updated the Patch, it was sort of shaky, but went thru and updated and then installed,they tried at 7:42am this morning, not successful, so I manually updated (custom update) at 11:45am today 5/02/2014. 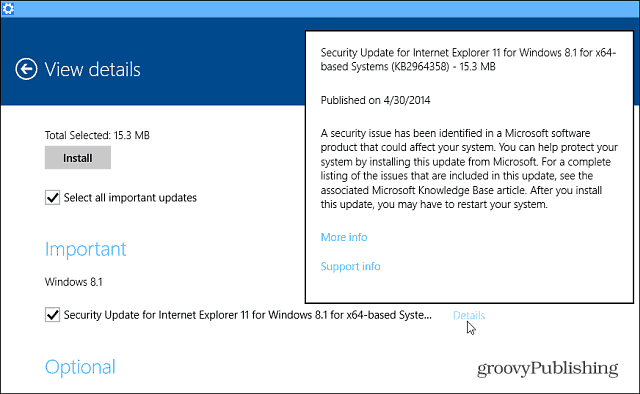 By the way I did a read from Microsoft Security that they can still do updated until April 2015.